Selah Press helps writers make ant hills out of the mountains that previously held them back. 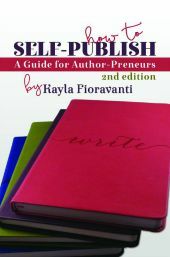 Selah Press started out as the self-publishing house of author Kayla Fioravanti in 2011. After Kayla self-published her fourth book in 2013, When I was Young I Flew the Sun Like a Kite, author David Sanford prodded her to write a book on self-publishing. That same year her friend and mentor Donna Maria chimed in with the same advice. Their inspiration became a seed. Once Kayla realized how she could empower other authors she was on board with the idea. She published the first edition of How to Self-Publish: A Guide for Author-Preneurs in 2013. Selah Press became an Indie Publisher in 2015 in response to the growing requests from writers to publish their books. Selah Press is a one-stop-shop for book publishing, author coaching, platform building, business coaching and author services. Selah Press, LLC is owned and operated by author, coach, speaker and publisher Kayla Fioravanti.